In his latest burst of fragging, conservative school reformer Robert Pondiscio recently argued that social justice-minded school reformers have only themselves to blame if suburban Massachusetts voters reject a ballot proposal to lift the cap on urban charter schools. Under this reasoning, I qualify as culpable because I recently called out White middle-class voters for organizing against a ballot measure that does not affect them but if defeated will hurt thousands of low-income urban families looking for quality school options. I feel qualified to take on affluent White suburban soccer moms because, well, I am an affluent White suburban soccer mom. And I know where our blind spots are. I know how obsessed and self-involved we can be when it comes to the achievement of our children, and how hard we’ll advocate when it looks like the educational opportunities (dare I say privilege?) of our Caitlins and Connors are threatened. And yes, I did just go there. I explicitly mentioned race, not to be provocative, but because race is a part of this—even if Massachusetts charter opponents like to pretend this is just about money and privatization. Racially driven educational inequities are something a lot of affluent suburban voters don’t like to think about or talk about, but I’m not inclined to give these voters a pass just because race talk makes us White people uncomfortable. Of course, acting on self-interest doesn’t make someone a racist. We want what we want for own kids, but we need to step back and realize this isn’t a zero-sum game. We won’t lose our water polo teams and orchestra programs if more children in cities (like Boston or Worcester) have better schools. If the answer turns out to be no, don’t point angry fingers at selfish Massachusetts voters. Blame falls equally upon a movement that has long been a bit too enamored of its own civil-rights-movement-of-our-time rhetoric to worry much about building a constituency among the middle class. Mr. Pondiscio’s market-driven solution to broadening that middle-class constituency is simple: Build charter schools for affluent families who want something even better than their well-resourced suburban schools and might otherwise enroll their kids in private schools or gifted magnets. I agree this approach might indeed appeal to the purely self-interested and engender political support from a population that is widely misinformed about charter schools. But seriously gunning for suburban schools, even the ones that are far more mediocre than they should be, also will open up a new front in the charter school wars—one that Mr. Pondiscio won’t be prepared to fight if he keeps firing at his fellow soldiers. I’ve had a few heartfelt exchanges with Robert, mainly over a touching reflection inspired by his only daughter’s departure for college, so I know we can disagree vehemently on some of these issues and still peacefully co-exist in the reform movement. When it comes to charter schools, I am moved by one goal: Improving educational equity for children of color and in low-income neighborhoods. I don’t care much about market demand, the politics of catering to the middle class, or expanding niche charter schools to affluent parents already blessed with great options. It’s not about White guilt or hating on rich people. It’s about knowing this: I got a good thing, and I don’t want to be selfish about it. 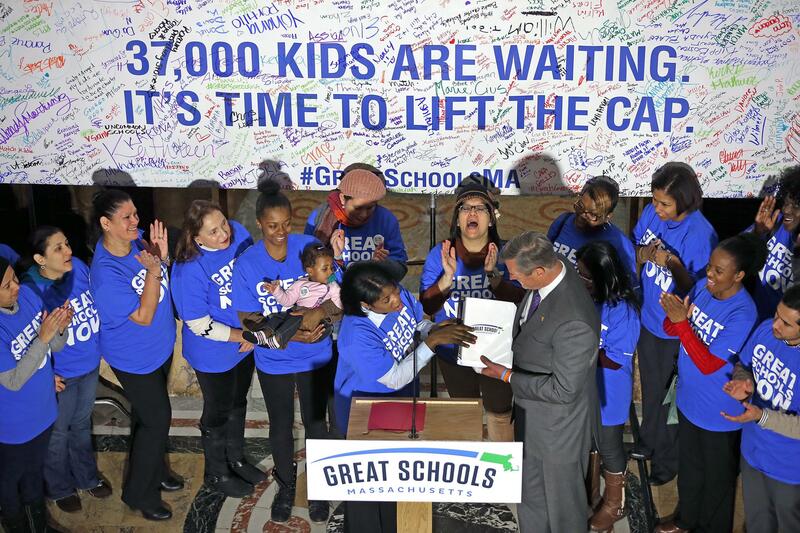 And I can carry that message to my fellow soccer moms without shouldering the blame for whatever ails the school reform movement…and whatever fails in Massachusetts. You fight your fires, Robert, and I’ll fight mine. We don’t need to fight one another. Photo courtesy of Boston Globe. An original version of this post appeared on Head in the Sand Blog.